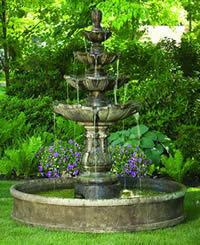 Massarelli is one of the premier manufacturers of cast stone fountains and statuary. Massarelli's still finishes each and every piece of ornamental stone statuary by hand. An extensive selection of finishes are available on the cast stone statuary and fountain collections. Massarelli's still takes enormous pride in offering the finest quality materials and designs. Customer service is of utmost importance to the Massarelli family.